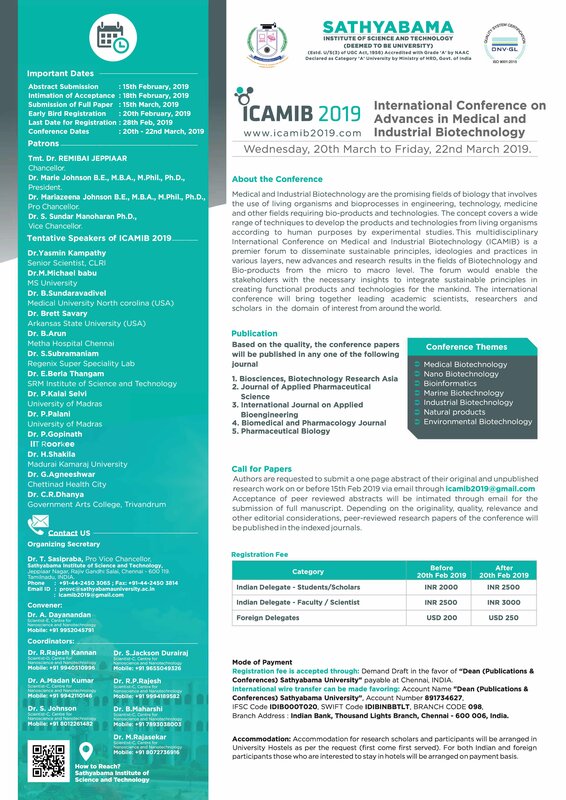 This multi-disciplinary International Conference on Medical and Industrial Biotechnology (ICAMIB) is a premier forum to disseminate sustainable principles, ideologies and practices in various layers, new advances and research results in the fields of Biotechnology and Bio-products from the micro to macro level. The forum would enable the stakeholders with the necessary insights to integrate sustainable principles in creating functional products and technologies for the mankind. The international conference will bring together leading academic scientists, researchers and scholars in the domain of interest from around the world. Sathyabama Institute of Science and Technology (Deemed to be University), Chennai, India.